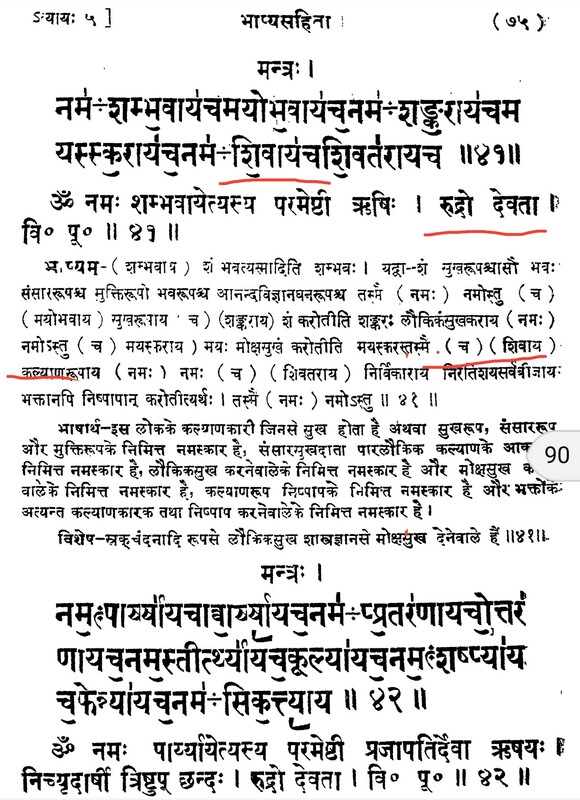 In which verse of Shukla YajurVeda is Om Namah Shivaya mantra present? I know that the 'Om Namah Shivaya' mantra is present in Krishna YajurVeda, but i have been led to believe that it's also present in the Shukla YajurVeda. Please share the location the verse. In the famous rudra ashtadhyAyi of MAdhyandina samhita. There is this mantra in the fifth chapter. It is taken from the moola samhita. Not the answer you're looking for? Browse other questions tagged vedas shiva yajur-veda shukla-yajurveda . In which all scriptures Om Namah Shivaya mantra is present? Does the Atharvasiras derives this mantra from YajurVeda or quotes from other Veda? Why is Yajurveda classified as Krishna and Shukla? Where does Yajurveda have “karpūragauraṁ karuṇāvatāraṁ…bhavaṁ bhavānīsahitaṁ namāmi” verse? Why is Devi Ambika called Lord Shiva's sister in Yajurveda? Where is Sri Rudram Hymn present in the Vedas? I know it's in Krishna YajurVeda. Is it present In Shukula YajurVeda also? Is Om namah shivaya mantra in Atharva Veda , SamaVeda or RigVeda?